Introduce students to the laws that affect their lives! 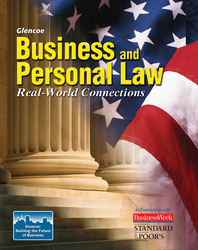 Glencoe Business and Personal Law: Real-World Connections provides Integrated Reading and Academic Strategies to improve your students' comprehension and reinforce academic skills to meet NCLB requirements. The text shows how the law works with real court cases in every chapter and unit. Cyberlaw bridges the Internet, business law, and consumer law. Global Law explores real-life examples of global business practices and strategies. Integrated Academic Skills help teachers reinforce student learning to help meet NCLB guidelines and provide rigor. Research-based Reading Strategies help students improve reading skills and comprehend key concepts and information. Partnerships with Standard and Poor's and BusinessWeek provide real-world activities that bring relevance to learning. Thematic Projects and Landmark Cases provide students with a stepped and leveled approach to case practice. Unit 1 - What is Law? Chapter 4: What is a Contract?